Baltimore — One after another, the mostly West African immigrant SuperShuttle workers poured out their grievances in front of the Veolia transportation headquarters in Baltimore on Jan. 20 — the Dr. Martin Luther King Jr. holiday — expressing their anger at what they described as near-slavery working conditions. 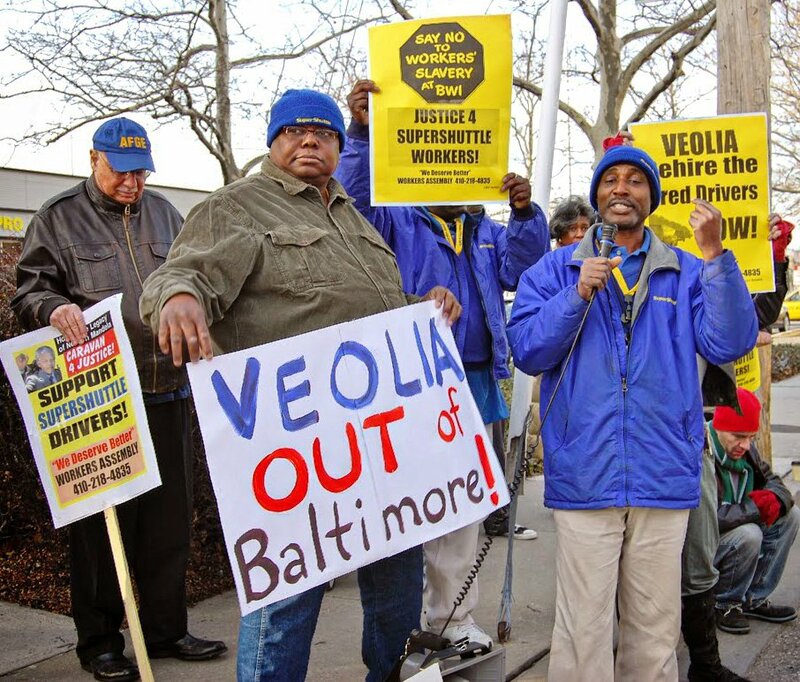 Global transportation giant Veolia, which owns SuperShuttle, is notorious for its anti-worker activities. Tony Koukou Yovo, who was fired after he spoke out against Veolia’s practices, and Patrick Benhene, another outspoken leader, declared their intentions not to be silenced. They were followed by many co-workers, like Mohammad Cisse, who described how he had to sleep in his van to barely break even financially and how his family suffered. Claire Evans, a SuperShuttle leader from Washington, D.C./Virginia, expressed her support for her co-workers. Countless other workers took the microphone describing terrible working conditions and why they were resisting. The group rallied for approximately an hour, then marched to North Avenue to take their message to a larger number of people. Prior to the rally at Veolia’s headquarters, SuperShuttle workers and Workers Assembly volunteers distributed thousands of flyers and carried a large banner calling on people to support the workers in the official King holiday parade. The rally and march were sponsored by the “We Deserve Better” Workers Assembly and Food and Commercial Workers Local 1994. Amy Millar and Josh Ardison, organizers with Local 1994, spoke on behalf of the union. Other speakers included Sharon Black, Workers Assembly representative; Cory McCray, International Brotherhood of Electrical Workers and a candidate for Baltimore’s 45th District seat in the Maryland House of Delegates; and Marice Morales, a Peruvian immigrant. A number of groups and individuals attended in support, including Leon Purnell, the Southern Christian Leadership Conference, and anti-war and Occupy activists.